One of the most popular tourist attractions in Tropical North Queensland, the Great Barrier Reef is a Marine Park off the coast that is comprised of 880 islands, 3000 smaller reefs and thousands of types of marine life, birds and plant life. With so much colourful coral and tropical fish to discover, holidays to the Great Barrier Reef are a fantastic option for couples as well as families. Although there are plenty of day trips, snorkelling expeditions and scuba diving adventures to be enjoyed on the reef, there is so much to explore in this stunning region that most visitors prefer to enjoy an extended stay and not only visit the Great Barrier Reef but take in the amazing sight from the air with a scenic flight or head to the surrounding Daintree rainforest and tourist towns of Kuranda. Gateway to the Great Barrier Reef and Daintree rainforest, Cairns is also a modern holiday town offering an excellent range of waterfront accommodation surrounding by shopping, dining and entertainment options. 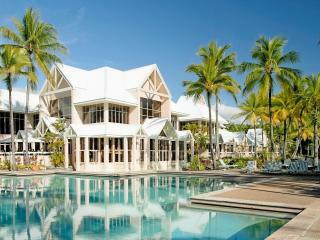 Cairns is also renowned for its stunning beachfront Esplanade offering plenty to see and do. Less than an hour north of Cairns, Port Douglas enjoys plenty of exciting tour options out onto the Great Barrier Reef and enjoys a charming, laid back atmosphere. The scenic coastal town is also home to the famous 4 Mile Beach and Dicksons Inlet and is also close enough for exploring the Daintree. The Daintree is a World Heritage listed natural wonder its own right but also offers access to the amazing Great Barrier Reef. Daintree accommodation is designed to be sensitive to the environment surrounding it and offers a range of eco-lodges and environmentally friendly resorts for an authentic rainforest experience. 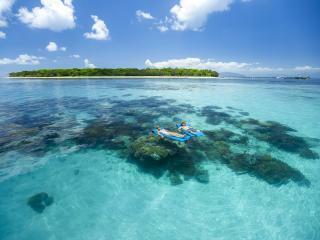 There is also a fantastic range of accommodation options located on the reef itself to suit all travellers and budgets including Green Island, the Whitsundays, Heron Island, Lady Elliot Island and Wilson Island which provide the easiest access to the reef and an unbelievably unique holiday experience.